PIERRO (AUS) (Bay 2009-Stud 2013). Leading 3YO Male on the 2013 WTR (Sprint). Champion 2YO in Australia in 2011-12. 11 wins-6 at 2-from 1000m to 1600m, A$4,536,650, ATC Golden Slipper S., Gr.1, Sires' Produce S., Gr.1, Champagne S., Gr.1, Canterbury S., Gr.1, George Ryder S., Gr.1, Silver Slipper S., Gr.2. Out of a half-sister to SW Laverock (Longchamp Prix d’Ispahan, Gr.1). Sire of SW Tulip (ATC Magic Night S., Gr.3) and of Pierata, Pierone and of the placegetters Aqua d'Ivina, Furlana, Hong Qigong, Ipso Facto, etc. His oldest progeny are 2YOs. CELEBRITIES CHOICE, by Redoute's Choice. 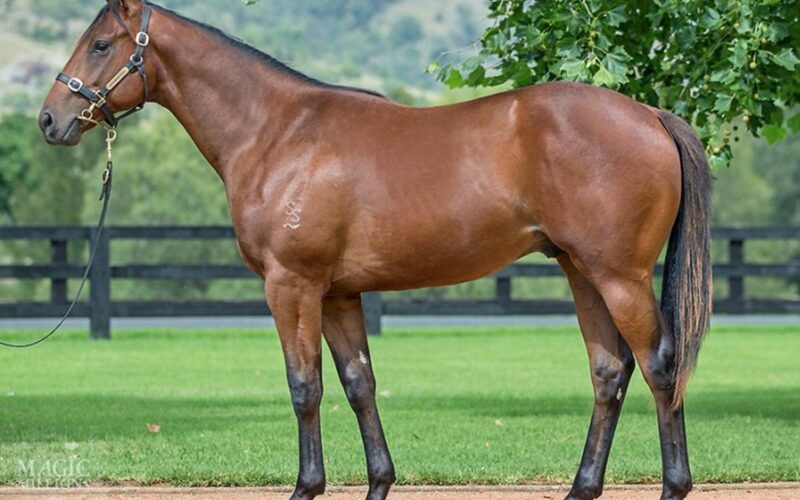 Winner at 1200m, 3d ATC TAB Ipad App H., Hyland Race Colours H. Sister to FLORENTINA, half-sister to GATHERING. This is her first foal. Villa Carlotta (Street Cry). Winner at 2, A$78,800, in 2016-17, ATC Staff Recognition Day 2YO H., 3d ATC Reisling S., Gr.2, 4th ATC Percy Sykes S., Gr.2. Via Napoli. 3 wins at 1400m, 1600m, A$158,225, to 2016-17, ATC Anzac Day H., DX Solutions H., NSW Tatt's RC Schweppes H., 2d ATC Ranvet H., McGrath Estate Agents H., Pluck at Vinery H., 3d ATC Pluck at Vinery H.
Celebrities Choice. Winner. See above. Eastern Cape. Winner at 1300m in Aust. Wahng Wah. 3 wins to 1250m to 2016-17, ATC TAB Rewards H., 2d ATC Schweppes H.
I'll Fly Away. 3 wins from 1400m to 2050m in 2016-17, MVRC Happy 70th Errol Perera H.
Celebria. 3 wins. See above. UMATILLA (Miswaki). 7 wins-3 at 2-to 1200m, A$683,305, WATC Karrakatta P., Gr.1, VRC Hilton on the Park S., Gr.3, SAJC Da Costa P., L, 2d VRC Lightning S., Gr.1, VATC Blue Diamond S., Gr.1, SAJC Breeders' S., Gr.2, STC Pago Pago S., Gr.2, South Australian S., Gr.3, MVRC Stanley Wootton S., Gr.3, SAJC DC McKay S., Gr.3, National S., Gr.3, VATC Rubiton S., Gr.3, 3d VRC Sires' Produce S., Gr.1, Newmarket H., Gr.1. Sire. RULING DYNASTY (Medaglia d'Oro). 4 wins from 1600m to 2400m, A$221,785, to 2015-16, City Tattersalls Club Cup, L, 3d ATC Winter Challenge, L.
PLATINUM SCISSORS (Danehill). 5 wins from 1400m to 2000m, A$982,800, AJC Spring Champion S., Gr.1, MRC Norman Robinson S., Gr.2, GCTC AD Hollindale S., Gr.2, Newcastle JC Newmarket H., L, AJC Eastlakes H., 2d BTC Doomben Cup, Gr.1, NSW Tatt's RC Chelmsford S., Gr.2-twice, STC Gloaming S., Gr.2, Tulloch S., Gr.2, Hill S., Gr.2, BTC Labour Day Cup, Gr.3, 4th AJC George Main S., Gr.1. Sire. PRECIOUS LORRAINE (Encosta de Lago). 3 wins-2 at 2-at 1600m, 2400m, A$247,750, South Australia Fillies Classic, Gr.3, VRC Gibson Carmichael S., L, SAJC Oaklands P., L, 4th MVRC AAMI Vase, Gr.2. SHOALS (Fastnet Rock). 3 wins at 2, A$566,650, in 2016-17, ATC Percy Sykes S., Gr.2, VRC Thoroughbred Breeders S., Gr.3.